Following the work that I did during and after the Hebden Bridge Blues Festival in 2014 and subsequent exhibition at Hebden Bridge Town Hall the new organisers of the Colne Blues Festival have named me as Artist-In-Residence for 2017. Massive thanks to Jason Elliott and Paddy Maguire for providing me with this opportunity. I have painted a number of this year’s acts, Aynsley Lister, Joanne Shaw Taylor, Julian Burdock and most recently King King and I am very excited about working with new acts. 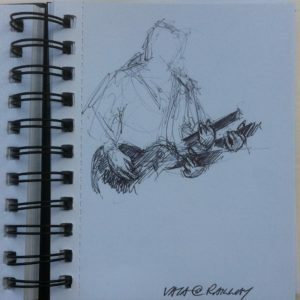 Paddy and Jason were kind enough to give me free range at The Hebden Bridge Blues Festival where I was able to sketch the bands during performance. I prefer to draw from life wherever possible because when you draw, you have to really look and when you really look, you really see. I take many photographs as well but through drawing from life little nuances are discovered on how musicians hold themselves or how a little finger on a fretting hand is held. These sketches are done incredibly rapidly and may not mean much to the casual observer but they are bread and butter to me. 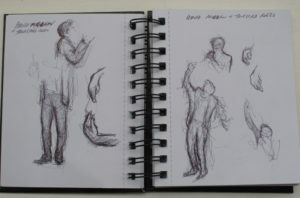 The sketches along with the many, many photographs combine with my memories of the concert. No matter how many photographs are taken sometimes a certain flash of colour or a particular reflection just does not get captured. It is vital for me to be at the concert so that I can incorporate these things from my memories. Even though I don’t actually have my paints with me at a gig, I am “painting” throughout! I have turned down a number of commissions when I have been asked to paint a band where I was not at the gig. I have to be there. My paintings are about the atmosphere and I feel that I need to have experienced it for my work to have any integrity. Sometimes I have been asked “Which song is that painting from?” and the answer is whichever song you like! This isn’t a glib reply but really, it could be, for I use the sketches, my memories and a combination of photographs from across the performance. Real life does not always make good art. The paintings have to “work” as paintings..not merely a visual record of a specific moment. 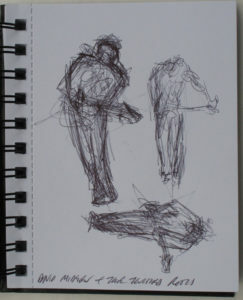 The posture of the lead guitarist may be from the end of the gig, the posture of the vocalist might be from my sketchbook and the colour of the dominant spot-light may be from memory. I will often use digital manipulation techniques to compose the painting. By “Photoshopping” various members of the band from various photographs into one I can quickly experiment with the composition before putting paint to canvas. I usually work in oil paint and because of the slow drying times I prefer to have at least two or three paintings at varying stages of progress at any one time. Every painting will present its own challenges, of course, but I tend to work on each canvas over a period of three or four weeks…although I have just finished one after nearly four months! I may decide that some experiences would be better expressed through printmaking so lino-cuts, dry-points, etchings and/or mono-prints might be produced. Having seen the line-ups, The Great Rhythm and Blues Festival in Colne is likely to keep me busy until Christmas 2017…at least! I am happy to share works in progress including barely started, half finished and works that need “tweaking” and will regularly do this via social media (FaceBook, Twitter, LinkedIn, Instagram and my blog) and eventually the finished works will be uploaded to my website. In addition to this each year I arrange two OPEN STUDIO events (May and November) at the studios in Falcon Mill. But of course if anyone wants to visit me at the studio to see works in progress or finished pieces, just contact me and I’ll make sure the kettle is on when you arrive! Once completed the works are then available to buy. Every May and October! Drinks and nibbles available!